The below artworks are the most important by Claude Monet - that both overview the major creative periods, and highlight the greatest achievements by the artist. Artwork description & Analysis: Women in the Garden was painted at Ville d'Avray using his future wife Camille as the only model. The goal of this large-scale work (100" by 81"), while meticulously composed, was to render the effects of true outdoor light, rather than regard conventions of modeling or drapery. From the flickers of sunlight that pierce the foliage of the trees to delicate shadows and the warm flesh tones that can be seen through his model's sleeve, Monet details the behavior of natural light in the scene. 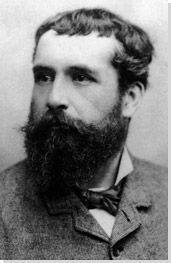 In January 1867, his friend and fellow Impressionist Frederic Bazille purchased the work for the sum of 2,500 francs in order to help Monet out of the extreme debt that he was suffering from at the time. 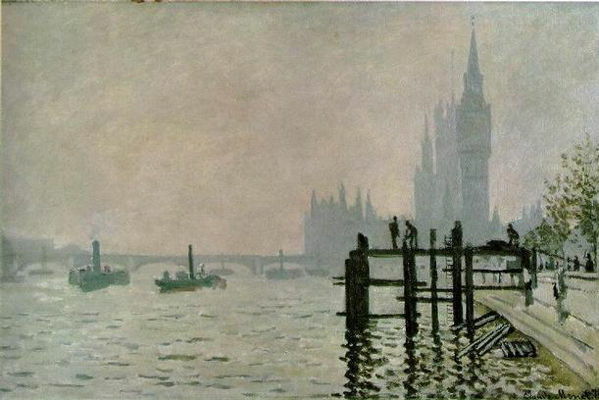 Artwork description & Analysis: Painted on the Embankment in London, Monet's Westminster Bridge is one of the finest examples of his work during the time he and his family were in wartime refuge. This simple, asymmetrical composition is balanced by the horizontal bridge, the boats floating upon the waves with the vertical wharf and ladder in the foreground. The entire scene is dominated by a layer of mist containing violet, gold, pink, and green, creating a dense atmosphere that renders the architecture in distant, blurred shapes. 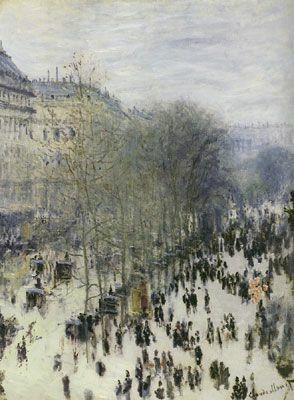 Artwork description & Analysis: Boulevard des Capucines captures a scene of the hustle and bustle of Parisian life from the studio of Monet's friend, the photographer Felix Nadar. Applying very little detail, Monet uses short, quick brushstrokes to create the "impression" of people in the city alive with movement. Critic Leroy was not pleased with these abstracted crowds, describing them as "black tongue-lickings." Monet painted two views from this location, with this one looking towards the Place de l'Opera. The first Impressionist exhibition was held in Nadar's studio, and rather appropriately, Monet included this piece in the show. 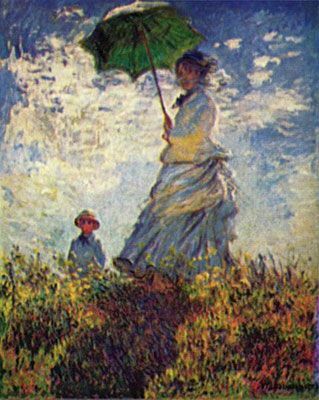 Artwork description & Analysis: One of Monet's most popular figure paintings, Lady with a Parasol showcases the woman's accessory. 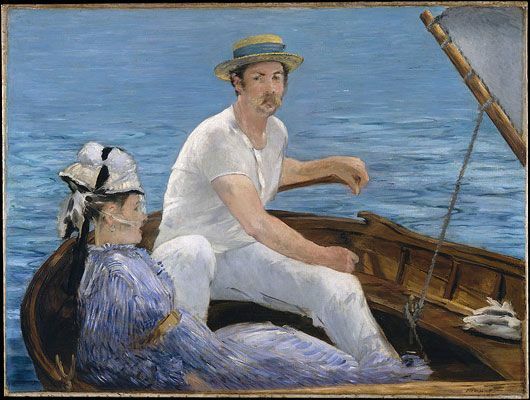 The parasol itself makes many appearances in his work, primarily because when painting from real life outdoors, most women would use one to protect their skin and eyes. But the object also creates a contrast of light and shadows on the figure's face and clothing, indicating which direction the actual light is coming from. Quite uniquely, Monet paints into the light letting the model's features fade into the shadow. Most artists would avoid such a positioning of their subject as it is difficult to reproduce any detail - and even to look at your subject. But Monet is interested in light itself, and captures it in the scene in an unmatched way. Artwork description & Analysis: Historians and scientists believe that Monet happened upon discoveries in vision and optics. 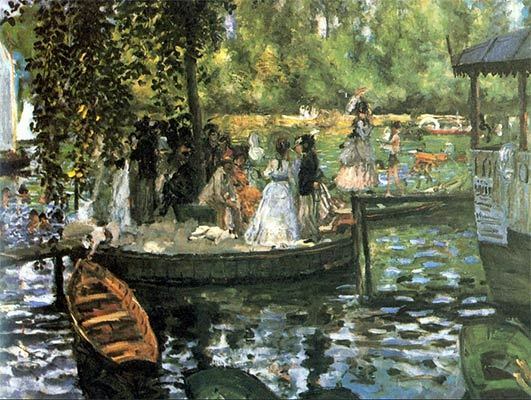 Professor Ian Aaronson believes that Monet was endowed with hyper-sensitive visual abilities where he could notice things that most people would miss. For example, in this work if one were to look at the way the flags themselves are painted, they look quite blurry and unclear. 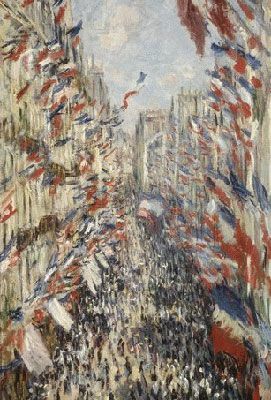 But when the viewer looks down at the crowd, the flags seem to wave in peripheral vision (best to try this on the real painting, not a reproduction). As in this example, Monet seems to have come upon several particularities of vision, and painterly effects, that were not properly proved by science for many years after his death. 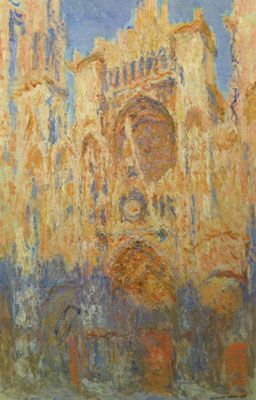 Artwork description & Analysis: Monet's Rouen Cathedral: The Facade at Sunset series is one of his most renowned. He painted the cathedral at different times of day to explore the effects of different light during winter. The burnt orange and blue appearance of the cathedral dominates the canvas, with only scattered views of sky at the top. Layered over the top of the Gothic structure, the brushstrokes play with the light and atmosphere on the stones, and the details on their carved surfaces. In 1895, he exhibited twenty Cathedrals at the Durand-Ruel Gallery that were both criticized and praised by viewers that either struggled with or championed his artistic, scientific, and poetic innovations. As art historian Madalena Dabrowski wrote: "the site is [only] a reference point, but is transformed and conditioned by light, color, and Monet's own vision." Painting in a series, or making any kind of artwork with subtle changes from one piece to the next has been a staple of modern art for many artists, from Andy Warhol to the Minimalists, to Conceptual artists. 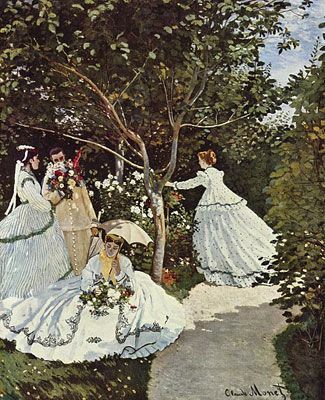 Not only has it been a way for artists to explore subtle difference between subjects, but some artists reference Monet directly in their series works. Artwork description & Analysis: The Nymphéas cycle is a part of Monet's water landscape group that he started working on in the late 1890s. As explained on the Musée de l'Orangerie website: the word nymphéa comes from the Greek word numphé, meaning nymph, which takes its name from the Classical myth that attributes the birth of the flower to a nymph who was dying of love for Hercules. In fact, it is also a scientific term for a water lily. 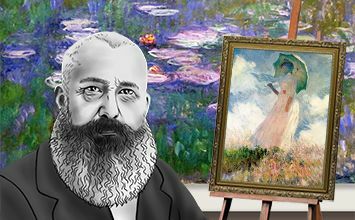 This series occupied Monet until his death 30 years later and includes dozens of canvases creating a panorama of water, lilies, and sky in his studio inspired by his Giverny garden. 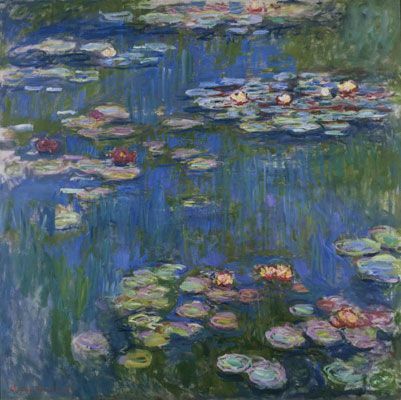 The most famous of this series are the eight large panels of Water Lillies that are installed in two eliptical rooms of the L'Orangerie museum in Paris. Monet describes his goals for the project: "Imagine a circular room, whose walls are entirely filled by a horizon of water spotted with these plants. Walls of transparency - sometimes green, sometimes verging on mauve. The silence and calm of the water reflecting the flowering display; the tones are vague, deliciously nuanced, as delicate as a dream." The ultimate installation is considered to be one of the greatest achievement of Monet, Impressionism, and even 20th-century art. 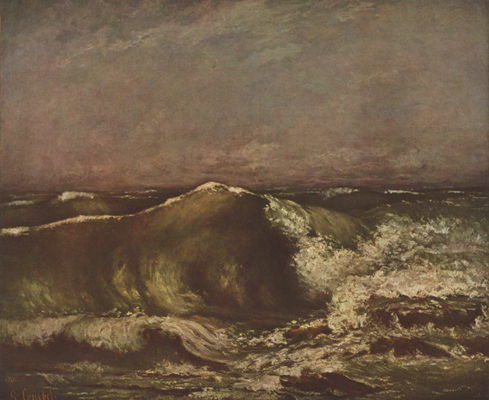 The lighting and setup in the museum maximizes the viewers' experience next to these works, providing, as Monet said, an "illusion of an endless whole, of a wave with no horizon and no shore". These works would be enormously influencial for many artists, but the all over composition would particularly inspire the Abstract Expressionist large-scale canvases of The New York School.